There have been so many advances in the medical space, it’s about time medical space itself advanced. Viva MedSuites provides advanced medical office space and service sharing to forward-thinking medical practices. We have created an entirely new option for medical practices looking for a better alternative to expensive and risky direct-leasing, sub-leasing or time-sharing. Whether you are searching for clinic timeshare space, medical coworking space, shared medical office space or subleasing medical space, you have found the future of medical officing solutions. Our shared medical office space and services are ideal for many types of medical practices, including general practitioners, surgeons, medical specialists, naturopaths, physician assistants, nurse practitioners, MedSpa uses and more. Viva MedSuites offers medical clinic timeshare space and services to a variety of medical and wellness practitioners including general practitioners, surgeons, specialists, naturopathic doctors, nurse practitioners and more. A professional medical clinic presence fully furnished, equipped, & ready for you to move in tomorrow. If you are looking for sublet medical space, occasional use medical space or doctors office daily rentals, Viva MedSuites has you covered. Viva MedSuites is a new concept in shared medical office space. Our first location is in North Scottsdale, AZ, serving North Phoenix, Scottsdale, Paradise Valley, Fountain Hills, Cave Creek and surrounding areas. More locations coming soon. WHAT A GREAT IDEA! Now I can have an office available on short notice to see patients - whenever I want to, without paying for a full time lease. I wish I knew about this option sooner. The office is very clean, complete, and very professional. I recommend any of you out there with a need for part time space in North Scottsdale to consider this option. Viva Med Suites is a fully functional turn-key, clean and quiet part-time office to see my patients ,with minimal investment, and minimal financial risk. Impressed with the cleanliness of the facility and the great hours that allow me to be flexible as a physician. The business model is great for any docs who need to be somewhere part time but don't want to pay an outrageous amount of money each month. Highly recommend it! Viva MedSuites is perfect for entities that require first class medical facilities conveniently located, that don’t have a need, or need at this time, for a long-term lease for expensive space they’re not going to use very often. It is very cost-effective. Everyone is very cordial and friendly, And the management is excellent. 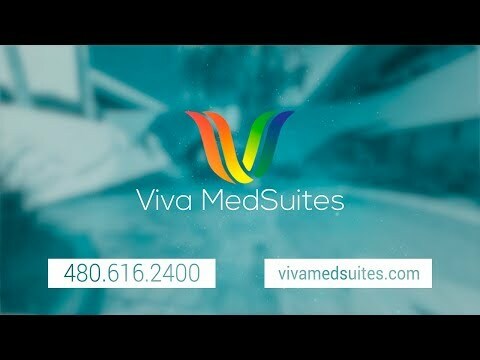 The first Viva MedSuites location is at 9700 N. 91st St., Suite A-115, Scottsdale, AZ 85258. It is located in the heart of Scottsdale’s medical corridor near Shea Blvd. and the 101 Freeway. The location has 10 private exam rooms that you can access at a very affordable hourly or daily rate basis. We’ve re-designed medical office space in Scottsdale to meet the needs of today’s medical practitioners much better than traditional medical office space does. So much has advanced in the medical space, it’s about time medical office space advanced too. Traditional medical office space or doctors office space in AZ is designed only for the large space user that is comfortable having no change in medical space needs for 5 to 10 years. How many practices does that still work for in today’s ever changing medical environment? Even existing timeshare medical clinics don’t really work for the fast changing needs of many of today’s medical practices or for new and growing practices. Viva MedSuites is the new solution that provides maximum scalability and flexibility for medical and wellness practitioners. Tell us a little bit about yourself and what you’re looking for and someone will get back with you shortly to answer your questions and if you’re interested in touring, to schedule a day/time for a tour.